Action Wildlife Removal technicians use a variety of humane and effective methods to safely get invasive wildlife under control in Georgetown. Our wildlife removal technicians try not to come in direct contact with wildlife and therefore use a one way door system whenever possible to solve the problem. The removal of all wildlife, in or on your property will be performed by a technician who is experienced with all kinds of wildlife, as sometimes home and property owners are unaware of the species. Breeding seasons vary from one species of wildlife to the other. Having an experienced and professional technician to handle all of your wildlife issues will put you back in control of your property and without causing any harm to the wild animal in question. Wildlife will continue to return into homes and buildings as long as there are opportunities welcoming them. These structures serve as warm, safe and perfect nesting and den sites for all wild animals. Residents of Georgetown often neglect animal intrusion prevention work around their home or office until it is too late. Action Wildlife Removal technicians will safely, effectively and humanely remove all unwanted wild animals. Our technicians will inspect your roof, attic, walls, insulation, walls, vents and all possible areas of vulnerability and give you a thorough description of what is happening in your home or office. Action Wildlife Removal technicians are specialists in the safe, effective and humane removal of wild animals and are also highly skilled with repair and the restorations required to fix the damage caused by wild animals. Wild animals can damage your home and can also carry dangerous diseases that can put your family’s health and well being at risk. We’ll arrange an inspection to investigate your wildlife nuisance. After we diagnose the problem, we can give you a clear estimate for the job. Give us a call and tell us your situation, and let us find a fix for you today. 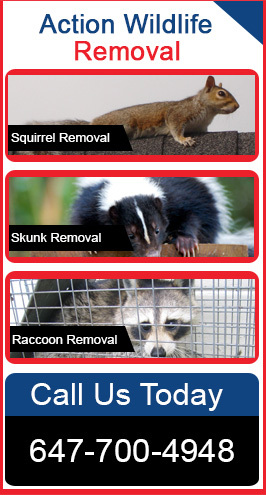 Contact our experts to handle your wildlife removal needs.